No feline to appear in this series has history like today’s beauty, whom I first heard about six years ago. When coming or going with long-lost Kuma, through our back gate into the alley, I often chatted with Maxine’s owner. He rode an adult-size tricycle and loved to talk about his cats. These companions meant much to him. Younger than me, he was effervescent, despite diminishing vitality from illness. Some people, by just looking at them, you know they peer down the tunnel to the end of the line. One day passed by, and he didn’t. He was absent for a few days longer. Then forever. I know just the one kitty’s disposition, and even then only learned it recently. On September 25, 2017, at 7:09 p.m. PDT, which was about 30 minutes after sunset, I saw Maxine outside her house on Maryland Ave. between Madison and Monroe. Eerily, she lives across the street from an apartment building alongside the canyon where city workers found Kuma’s collar following his disappearance in January 2012. Her owner, who knew the other, walked up soon after. We conversed, and he tried to hold Maxine still for a portrait. But she sought pats, thus moving too much, and iPhone 7 Plus proved a poor low-light shooter. Over the next six weeks. 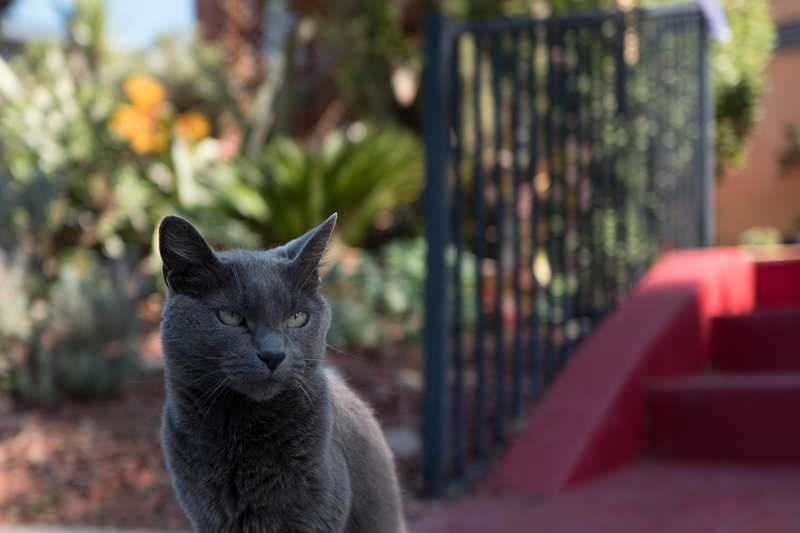 I frequently passed by the property looking for caretaker, cat, or—better—both. On November 5, three days before vacating our old apartment, while cleaning up the garage, my wife pointed out Maxine strutting doen the alley. I had never seen the kitty there before and pursued with iPhone X. The quick photos that I got were okay, but I wanted better. Yesterday, walking down Maryland, I came upon Maxine’s owner watering his plants. I stopped to confirm her name and to offer friendly banter. Not long later, she came outside the house and demanded attention, which I gave while trying to capture a good portrait. The early efforts proved futile, because she continuously rubbed her head against my hand and jeans. Little later, a grey-haired couple came by on fancy roadbikes, stopping to visit with their long-time neighor. The husband and wife planned to ride 32 kilometers (20 miles) to Imperial Beach, with tacos their reward at the end, she said. I piped in that their trip could be a California cultural stereotype: “Let’s bike 20 miles to the beach for a taco”. While we gabbed, the feline finally settled down, allowing me to capture the moment. Luckily, I carried Leica Q. The cropped Featured Image demonstrates the camera’s magnificent bokeh capability—thanks in part to the aperture, full-frame sensor, and magnificent wide-angle lens. I originally produced two JPEGs from DNG RAW: One unaltered (here), and the other auto-tuned, which I chose to use. I shot the companion pic immediately in succession, and vitals are same for both photos: f/2 (manually set), ISO 100, 1/1250 sec, 28mm; 11:28 a.m. PST. Maxine is nine years old, which in too many ways is remarkable. 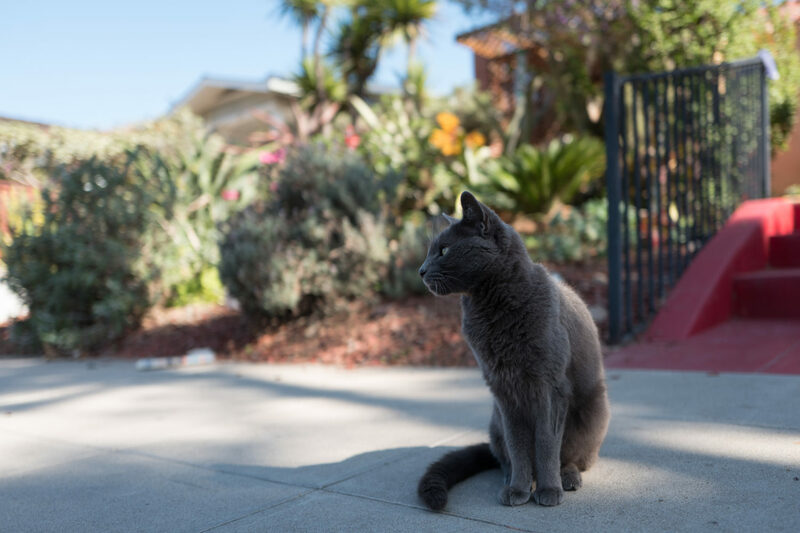 Her owner (rightly) worries about her crossing Maryland Ave. (where Kuma once was hit by a car) and journeying down into the canyon (where coyotes live). But she stays indoors at night, which reduces some of the risk. Seeing the cat yesterday, and remembering her original owner, sadly reminded me how easily we forget about people. He was an acqaintance, at best, but nevertheless somone I engaged with often enough. He had a memorable continence, and the tricycle made him stand out from all other neighbors. Yet not until learning that Maxine was his cat had I thought about him in years. How sad is that? You should also visit with: Scruffy, Roly Poly, Woo, Skull, Biscuit, The Colonel, White, Chipper, Frisky, Stretch, Needy, Farfisa, Mates, Hunter, Pee-Pee, Blue, Blue Too, Bonded Pair, Patience, Fess, Jumper, Frenemy, Looker, Cozy, Scout, Lurks, Skit, Mini, Betty, Black and White, Stalker, Bell, Chill, Sammy, Scratch, Poser, Star, Grey and White, Watcher, Herman, Comet, Roman, Willow, Chub, Nimbus, Watson, Lilo, Kit, Pepe, Twilight, Sebastian, Spot, Booger, Ash, Veruca, Riley, Mellow, Bonde, Flower, Glass, Black, BeBe, Fang, Bruce, Siamese, Pounce, Tortie, Haiku, Fraidy, Peso, Daniel Tiger, Dusk, Stride, Dainty, Spry, Tabby, Betty Too, Still, Levi, Shadow, Sophie, Wink, Ferals, Momma, Charlie, Tux, Cool, Benny, Jellicle, Itchy Valentino, Goldie, Nine, Amanda, Siesta, ChaCho, Charlie, Too, Mika, Crystal, Seeker, Mittens, Dancer, Smokey, Monkey, Captain Blackbeard, Season, Maven, Tink, Chunk, Curious, Hanoi, Bella, Tarry, and Guido.